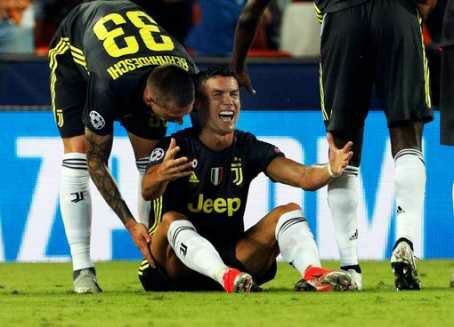 Cristiano Ronaldo in tears after a red card on Juventus Champions League debut against 2-0 victory over Valencia in the Group H opener on Wednesday night at Mestalla Stadium. The 33-year-old Portugal skipper has won the tournament in each of the past three years with Real Madrid but his attempts to win it for a fourth-straight season with his new club has got off to the worst possible start. Valencia defender Murillo tumbled to the ground after colliding with Ronaldo but former Real Madrid forward slight tug of his hair of Colombia World Cup star which causes the centre referee to sent five-time Ballon dOr winner out of the game in the 29 minutes of the encounter.Ronaldo was seen crying as he left the pitch in tears and it is his first ever red card in the competition for the all-the goalscorer in the competition. "You can't do that! ""I think he's got room to appeal.."
Ronaldo will miss Juventus’ next Champions League tie against Young Boys and he could to also be suspended for an emotional return to Old Trafford against former club Manchester United.